Perhaps you are familiar with the kuchisake onna, the slit-mouthed stalker of Japanese school children? Or maybe the tanuki and his giant man-crushing balls? The kappa, whose love of cucumbers may prevent him from removing your entrails through your derrière? No? Then you are not familiar with yokai. You should be. This week’s book giveaway, sponsored by Tuttle Publishing, is for Yokai Attack! 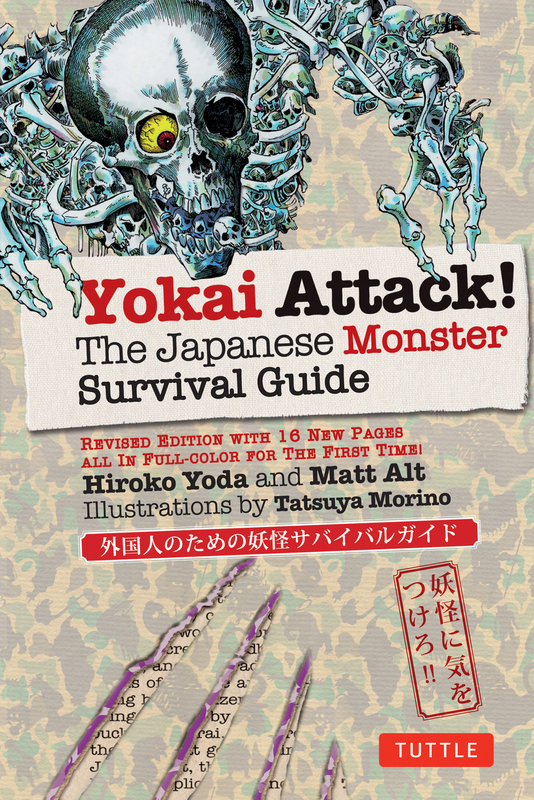 The Japanese Monster Survival Guide. Yokai are Japanese monsters. Ancient superstitions blame most everything on them, from earthquakes to taking a simple tumble on the road. Here’s a piece I wrote about them for Listverse.com, 10 Crazy Japanese Superstitions, if you are interested in what common occurrences the little monsters are held responsible for. Yokai are one of the best ways to learn about Japanese culture and history. They give you an angle on life in Japan that even the most astute historian can neglect. Take the futakuchi onna, a woman cursed with a mouth in the back of her head for starving her stepchildren. She is a glimpse into ancient domestic life, where the second wife didn’t often take kindly to children who weren’t her own. The te-no-me, another example, is the spirit of an ancient trader murdered on the road. He reveals how dangerous travel was for the common man during Japan’s Warring States period, and how easy it was to be set upon by the lawless era’s sanzoku (mountain bandits). Yokai Attack! is good fun–a nice catalogue of the more interesting yokai. It’s an easy read, but extremely well-researched. The book calls itself a survival guide, detailing each monster’s characteristics and what to do if encountered. Each entry is accompanied by an illustration and often includes an original woodblock print of the monster. It comes off as pretty whimsical, which is actually a nod in the direction of the old yokai encyclopedias its based on. Yokai have always been tongue-and-cheek. Probably the most famous work about them, Toriyama Seiken’s The Illustrated Night Parade of a Hundred Demons, includes dozens of monsters that are less folklore and more playful commentaries on ancient Japanese society. But despite it carrying on Yokiology’s (yes, that’s a word) tradition of playfulness, in Yokai Attack! each monster’s habits and history are solidly detailed, including some interesting tidbits that would be hard to acquire unless you were very knowledgeable about Japanese history and geography. There are also a lot of links to modern Japan, which I though was particularly interesting. To the authors I say, well done. I’ve read a lot of books about Japanese culture that, while very fascinating, were extremely dry. This book managed to be enjoyable without watering anything down. I’d recommend the book to anyone interested in Japan. Even if you’re not a monster fan, there’s a lot of Japanese culture and history there. Japan’s monsters are the perfect portal to understanding the culture that made them. So, if you want a free copy of Yokai Attack! The Japanese Monster Survival Guide, go to the Contact Me page and shoot me an email telling me so. You can just tell me you want the book, or a little bit else if you want. As usual, the winner will be chosen via the ancient Japanese method of drawing names from a samurai helmet. If that’s you, we’ll be in touch.